This classification covers establishments primarily engaged in manufacturing malt or malt by-products from barley or other grains. Malt is a barley kernel that has been allowed to sprout and is used primarily for brewing and distilling. It has long been a central element in beer production. Anywhere from 25 to 50 pounds of malt are used to make one barrel of beer. Malt is created by germinating moistened barley under controlled conditions for a short period of time, usually four days. The germination process activates the enzyme systems, specialized proteins that break down the barley's starch and protein. Once germinated, the "green malt" must be kilned, or dried with heat. Essentially, the malt is cooked to stop its growth, although the enzyme activity continues. Prior to kilning, the rootlets that appear during germination are removed and discarded. What is left after kilning is considered to be malt. About 90 percent of all malting barley grown is used by brewers, with the remainder used as feedstock. Brewers create a mash with the malt by mixing it with water and heating it under controlled conditions. During the mashing process, the enzymes break down the starch into sugars and proteins, creating a soluble mixture or extract. The soluble product is filtered, and yeast is added. Other starches such as corn or rice are added at this time, along with hops for flavor. All beer has some malt content. Budget beers usually are 50 percent malt and 50 percent corn or rice, while premium beer composition may be as high as 70 percent malt. Brewers generally specify to barley growers the variety of malt needed for particular brands. About 33 percent of the barley grown in the United States is used for malt by the food and brewing industries. Barley has been affected by acreage reduction programs through which the U.S. government has paid farmers to suspend the planting of barley on portions of their land. In 2001, barley acres planted reached a record low of 4,967, compared to the nearly 9,000 bushels planted in 1991. 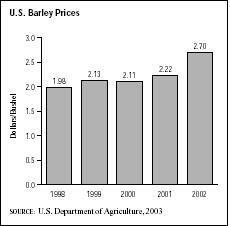 Between 1998 and 2003, annual U.S. barley production fell from 352 million bushels to 227 million bushels. Over the same time period, yield per acre harvested dropped from 60 bushels to 54.9 bushels. North Dakota, Idaho, Montana, Washington, and Minnesota were among the top barley producing states. A number of the major American beer producers maintained in-house malt operations in the early 2000s. Examples included Busch Agricultural Resources, Inc., a subsidiary of Anheuser-Busch Inc., which operated several malt plants that supplied the company with approximately one-third of Anheuser-Busch's malt needs. Miller Brewing Company, the second largest brewery in the U.S., had its own malt plant as well, located in Waterloo, Wisconsin. Great Western Malting Company was another leading malt producer. Great Western was a subsidiary of the ConAgra Malt network, which consisted of Canada Malting Company, Hugh Baird & Sons, and Argentine company Malteria Pampa S.A. ADM Malting Division, a division of Archer Daniels Midland, was one of the largest malting companies in the world. Another U.S. industry leader was Froedtert Malt Corp., the U.S. arm of the International Malting Company, a joint venture between Archer Daniels Midland and Lesaffre et Compagnie. Other malt producers included Cargill Malt, Rahr Malting Co., and Minnesota Malting Co. Both feed and malting barley averaged $1.98 per bushel in 1998. The price steadily increased throughout the late 1990s and early 2000s, according to the U.S. Department of Agriculture. By 2002, farmers were receiving an average of $2.70 per bushel. A major issue for maltsters and brewers was vomitoxin levels and growing scab-resistant barley. Growing malting-grade barley was difficult over the past years due to a vomitoxin-producing scab that affected the malting of barley. Although it did not affect humans, barley affected with vomitoxin disturbed the malting process. Another issue that concerned barley growers was the need for higher yielding malt barley varieties. The American Malting Barley Association, working in conjunction with Busch Agricultural Resources, Inc., and the breeding programs at North Dakota State University and the University of Minnesota, sought to develop new barley varieties. In the late 1990s, North Dakota State University developed ND15477, a six-row barley; the University of Minnesota worked on M98, a six-row barley; and Busch Agricultural Resources developed B2978, another six-row variety. In 2003, Busch Agricultural Resources developed the six-row B2482. American Malting Barley Association. Gleanings. Milwaukee, WI: 29 August 2003. Available from http://www.ambainc.org/ni/Tradition_Drummond_GleanAug03.pdf . U.S. Department of Agriculture. Track Records of U.S. Crop Production. Washington, DC: 2003. Available from http://usda.mannlib.cornell.edu/data-sets/crops/96120/track03b.htm .